Snyder‐Girotti stu­dents were cap­ti­vat­ed lis­ten­ing to NASA engi­neers. broad­cast with NASA. Always excit­ed to expose and teach young minds about space and space explo­ration, the NASA broad­cast­ers want­ed to explain a new type of space sta­tion known as “The Gateway.” Linking S‐G stu­dents direct­ly to astro­nauts pro­vid­ed a unique, authen­tic expe­ri­ence designed to enhance stu­dent learn­ing, per­for­mance and inter­est in sci­ence, tech­nol­o­gy, engi­neer­ing and math­e­mat­ics (STEM). 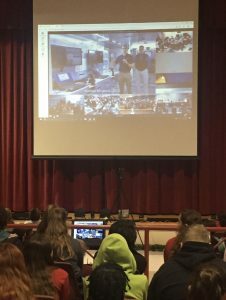 Under the direc­tion of edu­ca­tor Mary Gesualdi and the tech­ni­cal sup­port and assis­tance of IT direc­tor, Paul Hetherington, the ele­men­tary school set up a live feed and a high def­i­n­i­tion cam­era enabling stu­dents to ask ques­tions direct­ly to the NASA engi­neers. In prepa­ra­tion for the event, orga­ni­za­tions and schools par­tic­i­pat­ing in the inter­ac­tive expe­ri­ence were pro­vid­ed with spe­cif­ic ques­tions to inform view­ers and par­tic­i­pants about the mechan­ics of the space sta­tion, who will staff The Gateway, and future mis­sions. 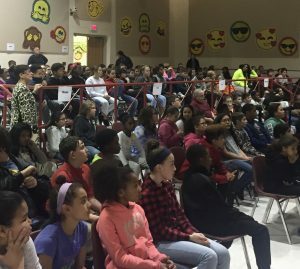 Students at Snyder‐Girotti ques­tioned the abil­i­ty of The Gateway to recy­cle air and water for humans who will spend extend­ed time in space. Once fin­ished, The Gateway will be the first per­ma­nent human space­ship in orbit around the Moon. The Gateway will be a part‐time home and office for astro­nauts far­ther in space than humans have ever been before. Snyder‐ Girotti stu­dents espe­cial­ly enjoyed receiv­ing a shout out from a Philadelphia native and cur­rent NASA engi­neer.